I just had my first, and hopefully last encounter with wax moths. 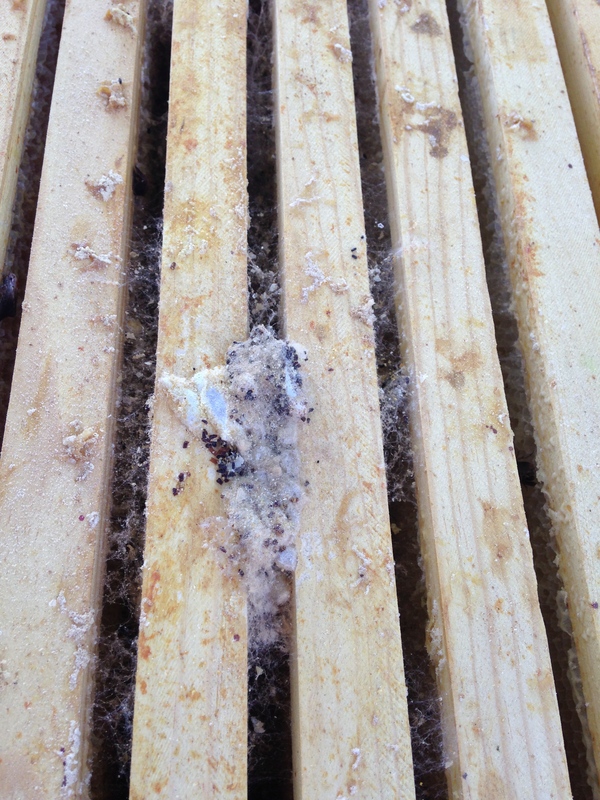 My fault…most wax moth encounters are due to the beekeeper’s negligence. I uncovered several stacked boxes of frames with drawn comb in which I had forgotten to add moth crystals. The frames had been stored there since mid-July. I could smell the stench upon lifting the cover – the frames were infested with wax moths, wormy larvae, webs and droppings – like a creepy, disgusting Halloween prop, only this was real. Blah! 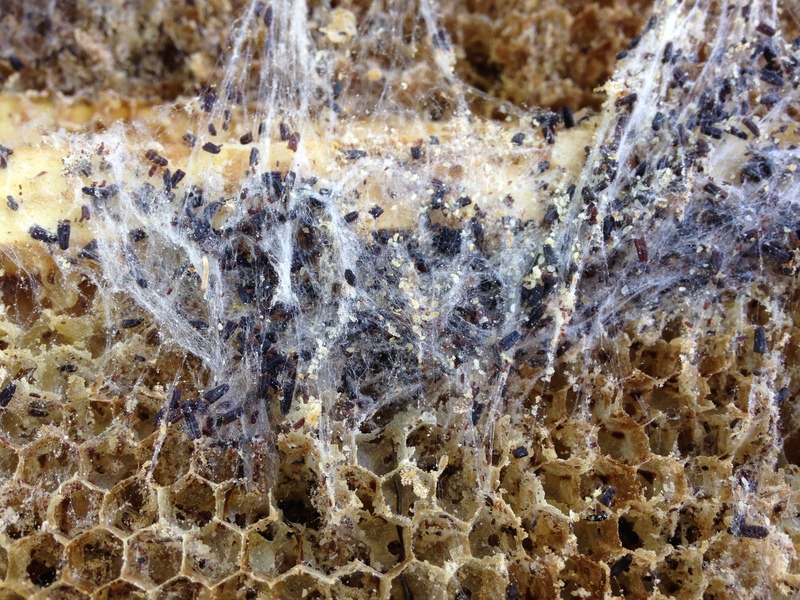 A wax moth infestation can destroy a hive. They like dark, warm areas with minimal air flow; and because they’re highly attracted to beeswax, the combination of dark, closed up boxes with frame upon frame of drawn comb is irresistible to wax moths who prey on and infest weak hives. I’m grateful they only infested two boxes of frames and not four or six. I’m even more grateful that they weren’t in my hives. What a horrible demise for bees, and a shameful mess for the beekeeper. There are several ways to store frames to prevent wax moth infestation. Store frames in an airy location with plenty of light. Moths do not like light, nor do they appreciate steady air flow. I’ve heard of beekeepers openly hanging frames across the inside of well-lit buildings or barns, for example. Use a fan to blow a steady flow of air through the frames. The downside would be the 24×7 operation of a fan (or two) over several months. Store frames in a truly airtight container. I know beekeepers who store their drawn frames in airtight rubbermade containers – like the kind you keep clothes in under the bed – and store them in their basements. However, you need to be 300% certain it is truly air tight. Wax moths can access the tiniest of openings. Store boxes and frames outdoors in freezing temperatures. All stages of wax moth will die within 24 hours in freezing temperatures (36 degrees F or lower). Store frames with PDB moth crystals. This is my method (so much for chemical free beekeeping). Only use moth crystals containing paradichlorobenzene (PDB). These will kill all stages of wax moth, except the eggs. The crystals will dissolve gradually over several weeks/months time, so check every few weeks to determine whether the crystals need to be replenished, otherwise, you risk the moths returning. When you’re ready to reuse the boxes and frames, air them out for 2-3 days before introducing them to the bees. So what steps did I take to clean up this mess and ensure it doesn’t happen again? Freeze the boxes and frames. Wax moths, eggs and larvae will all die if frozen for 24 hours. I have a freezer in the garage for freezing frames and boxes. This luxury has been put to great use over the last 2 years. It’s always a good idea to freeze boxes and frames before moving them to the hives, or even before extracting honey; or for saving honey frames until you’re ready to extract. I can easily fit two 8-frame boxes with frames into our upright freezer. Clean the frames. I placed a tarp on the ground in the driveway and grabbed my trusty pallet knife and scraped off the webs, droppings and debris, and cut out the areas that were severely damaged. Store the frames and boxes. I use moth crystals containing paradichlorobenzene (PDB) to store frames with drawn comb. No longer will I boast of chemical free beekeeping – this is my one vice. For me, it’s the easiest, most worry free way to ensure that your comb and boxes are moth free. I simply add a spoonful of crystals on a piece of cardboard that’s placed on top of the frames, then I add another box of frames and another piece of cardboard with another spoonful of crystals. When all boxes are stacked, air tight, then place a top cover on top with a heavy brick or object on top of that to weigh it down. The crystals will dissolve gradually, so check every few weeks to determine whether the crystals need to be replenished, otherwise, you risk the moths returning. When you’re ready to reuse the boxes and frames, air them out for 2-3 days before introducing them to the bees. Preferably in an open, well lit, well ventilated location. And if that location happens to bee below 36 degrees F, then even better! Just keep in mind that not all will bee lost. Wax can always bee rendered down in the spring and replaced with new wax, and frames that are salvageable can go back into the hives and will bee cleaned further by the bees. Bees are workers and cleaners. They’re programmed to build comb in the spring, so they’ll fill in the gaps and put the frames to good use. Waste not, want not…you’ve gotta love’em.